What is the LGBT community in 2015? 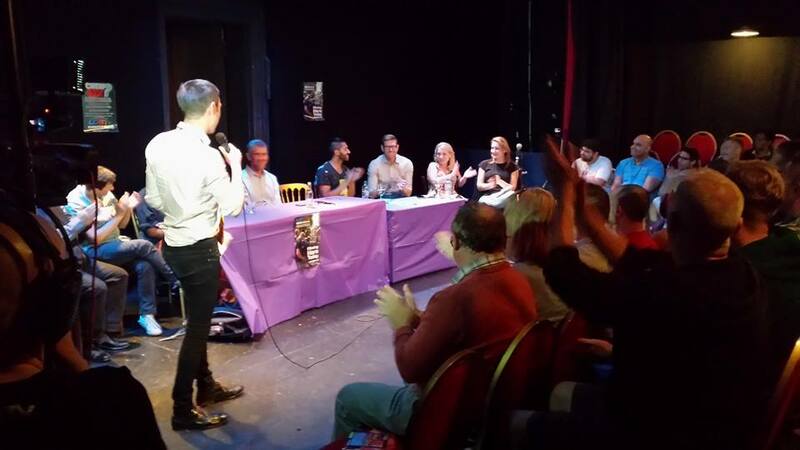 I attended this discussion last night at Landor Theatre, hosted by Pat Cash and featuring 9 very interesting spoken contributions from all parts of the LGBT universe and some input from the audience. My impression was that there is a strong desire for the Ls, the Gs, the Bs and the Ts to be in good relation to each other, but a good degree of frustration that perhaps they are not. Lesbian rage at feeling sidelined by gay men’s agendas over the past two decades was expressed, so was bisexual distress at the attitudes other queers can display towards them. Trans folks were in low numbers but then they did have their pride this past weekend. (I went to that Pride – a few hundred determined souls in Brighton – and came away with an understanding that the trans community is at a stage of fighting oppression and ignorance that gay men and lesbians were at in the 1970s). One gay men spoke for me when he spoke from the floor expressing his identification with all parts of our rainbow. I may be G, but on the inside i’m also L, B and T. There was of course mention of the chemsex explosion sweeping through gay men’s culture, and a strong feeling in the room that this community – or collection of communities – desperately needs a CENTRE in London (as is normal in most American cities for example) where discussions like this can take place all the time, plus workshops, groups and therapies. The general air was that we need to become a community that is taking care of itself, a community of people taking care of each other. Since 15 years i have spent much time in queer spirit and faerie communities, where CELEBRATION OF DIVERSITY, MEETING FROM THE HEART and LISTENING FROM THE HEART are what make the magic happen. Shaking off the bad attitudes and healing the wounds we have gained on our lifepaths soon reveals the loving heart in us all. Faeries reclaim our naturalness by experiencing it, in nature. We explore our nature as spiritual beings through meditation, dancing, drumming, sacred medicine journeys, fire ceremonies and drag. We celebrate life and celebrate the queer gifts we bring to it, creating a network of support, creativity, healing and self-expression. I see faeries as the scouts of gay life, on the fringes exploring the dream further than is possible usually in our cities. But the dream has to come home, to the whole of the global gay tribe … and this is my dream for the LGBT community in 2015, that it become a place of coming home, of self-discovery, of brother-sisterhood, of celebration, facing the challenges being sent our way and rising like a phoenix from the current drug and mental health crisis, from the sense of separation and division between the parts of our megatribe, just as we rose powerfully from the RAVAGES of the AIDS holocaust. Thank you for your words and it was good to share the evening with you. I feel that the need for a community taking care of itself was the powerful anchor which I took away from the evenings exchange. Once again I echo what you have said about those soke and I might say shared from a powerfully personal perspective.